Scheuermann's disease (SD) - osteochondritis of vertebral epiphyseal plates or adolescent kyphosis - was first described in 1921 by Holger Werfel Scheuermann, a Danish surgeon, as an osteochondrosis with cause unknown involving the spine and frequently causing lower thoracic kyphosis. 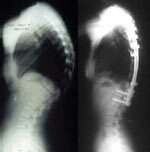 The term juvenile kyphosis has sometimes been used to designate this condition. Although many theories have been proposed, the cause of SD is still unknown. Currently under investigation are the roles of juvenile osteoporosis, hereditary factors, biomechanical factors, and a variety of other causes, but to date no specific etiology has been determined, except that there is a disruption in the normal development of the vertebral end plate. 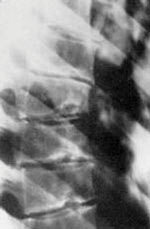 The disease is identified radiographically by the appearance of vertebral wedging in the thoracic or thoracolumbar spine, and irregularities of ossification of one or more vertebral end plates leading to anterior wedging of the vertebral bodies and causing varying degrees of thoracic kyphosis. Currently the diagnostic criteria for SD include the presence of abnormalities in at least three contiguous vertebrae, each of which should have wedging of 5 degrees or more. However, some patients have vertebral irregularity without wedging. The kyphotic deformity may become progressively more fixed in position. Radiographically, the affected vertebral bodies show an undulating superior and inferior surface with cartilaginous or Schmorls nodes and surrounding sclerosis. There is an increase in the normal thoracic kyphosis (greater than 35 degrees). Secondary findings may include loss of intervertebral disc height, wedging of the anterior portion of the vertebral bodies, and prolapse of large foci of intervertebral disc tissue anteriorly; which may lead to the formation of a limbus vertebra as a result of extension of the extruded anterior discal material beneath the apophyseal centres of ossification, separating them from the vertebral body. (Figure 1) Synostosis of one vertebral body with an adjacent vertebral body may also occur. Many patients are asymptomatic and only develop a mild increase in the thoracic kyphosis. Since SD does not progress once the patient's spine has reached maturity, the general consensus is not to intervene with treatment, but with observation and postural exercises. However, some patients suffer chronic back pain and progressive kyphosis; in these cases, treatment needs to be considered. There are only two documented methods of nonoperative treatment for Scheuermann's: corrective casts and the Milwaukee brace. Orthotic management has been shown to be effective in controlling a progressive curve in the adolescent patient. Treatment is dependent upon the magnitude of the deformity, pain complaints and patient maturity. No bracing is generally recommended for a kyphotic deformity of less than 60 degrees unless the deformity appears to be progressing; bracing is generally considered for curves between 60 degrees and 70 degrees if the patient is skeletally immature. Even patients with curves up to 80 degrees may respond if skeletally immature, but surgical intervention should be considered only at curves over 75 degrees. The Milwaukee brace has been documented as effective and is usually the treatment of choice for nonoperative treatment. Of course, requiring that an adolescent wear a Milwaukee brace for 18 hours a day for an entire year, which is about the average time required to improve the kyphosis, is difficult to say the least. However, consistent use of the brace can prevent the progression of the kyphosis. Chiropractic treatment and physical therapy when used along with bracing can help build strength and flexibility, and also increase range of motion. So, it appears that since the 1920s we have not made much progress in the understanding of the true etiology of Scheuermann's disease, nor has the treatment improved much over the years. The only choices presently for improving the kyphotic deformity are bracing and, if the deformity is severe, surgery. Fortunately, SD is self-limiting and statistically most patients do not develop kyphotic deformities in excess of 60 degrees. Orthop Clin North Am, 1999;30(3):475-87. Familial Scheuermann disease: a genetic and linkage study. J Med Genet, 1992; 29(1):41-5. Garoflid N, Fragniere B, Dutoit M.
"Round back" in children and adolescents [Article in French]. Rev Med Suisse Romande, 2000;120(10):815-20. Scheuermann's disease: the lumbar variant. Am J Phys Med Rehabil, 2004;83(6):467. Soo CL, Noble PC, Esses SI. Scheuermann's kyphosis: long term results with Milwaukee brace treatment. Orthotic results in adolescent kyphosis. Rachbauer F, Sterzinger W, Eibl G.
Radiographic abnormalities in the thoracolumbar spine of young elite skiers. Am J Sports Med, 2001;29(4):446-9. Sturm PF, Dobson JC, Armstrong GW. The surgical management of Scheuermann's disease. Boni T, Min K, Hefti F.
Idiopathic scoliosis and Scheuermann's kyphosis. Historical and current aspects of conservative treatment [Article in German]. Sachs B, Bradford D, Winter R, Lonstein J, Moe J, Willson S.
Scheuermann's kyphosis. Follow-up of Milwaukee brace treatment. J Bone Joint Surg Am, 1987;69(1):50-8. Hosman AJ, Langeloo DD, de Kleuver M, Anderson PG et al. Analysis of the sagittal plane after surgical management for Scheuermann's disease: a view on overcorrection and the use of an anterior release. Lim M, Green DW, Billinghurst JE, Huang RC et al. Scheuermann kyphosis: safe and effective surgical treatment using multisegmental instrumentation. Deborah Pate is a licensed chiropractor and a diplomate of the American Chiropractic Board of Radiology. A 1982 graduate of National College of Chiropractic, she was the first chiropractor accepted into a fellowship in osteoradiology at the medical center of the University of California, at San Diego. Dr. Pate served as a research associate in the radiology department at the VA hospital from 1984 to 1986, and as chiropractic director of the American Chiropractic Network (now American Specialty Health Plans), both in San Diego, California, for several years. Still a consultant for several insurance companies, she has practiced as a clinician and radiology consultant since 1984, and maintains a radiology consulting practice. Dr. Pate is also a state-appointed qualified medical examiner and a certified disability evaluator. She has taught postgraduate courses at Parker College of Chiropractic, Los Angeles College of Chiropractic, the University of California at San Diego, and other respected institutions.